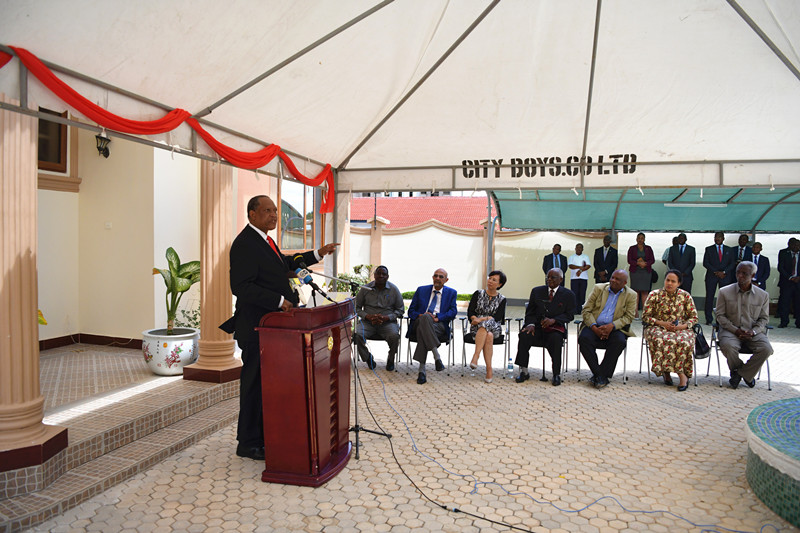 On April 12th, 2019, Chinese Embassy in Tanzania Dodoma Office was inaugurated in Dodoma, the new capital city of Tanzania. The inauguration ceremony was officiated by Chinese Ambassador to Tanzania H.E. Wang Ke and Minister for Foreign Affair and East African Cooperation of Tanzania Hon. Prof. Palamagamba J.A.M. Kabudi (MP). Other important guests included Minister for Industry and Trade of Tanzania Hon. Joseph George Kakunda (MP), Minister of State in Tanzanian Prime Minister's Office (Policy and Investment) Hon. Angellah Jasmine Kairuki (MP), Chairman of the Foreign Affairs Committee of Tanzanian National Assembly Hon. Azzan Mussa Zungu (MP), former Minister of Communication and Works of Tanzania Hon. Job Lusinde, Mayor of Dodoma Municipality, Prof. Davis Mwamfupe, etc. 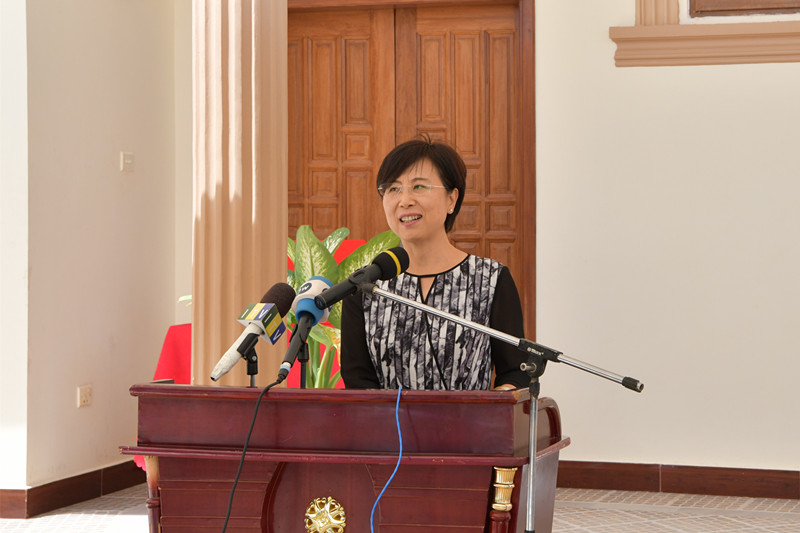 In her speech, Ambassador Wang Ke pointed out that the establishment of Chinese Embassy in Tanzania Dodoma Office is a concrete manifestation of China's support of major initiatives of the Tanzania Government. "Relocating the capital to Dodoma is a long-cherished wish which was first proposed by Mwalimu Julius Nyerere in 1973. It is significant for the central government taking advantage of the geographic location of Dodoma to maintain closer ties with various regions of the country and to strengthen the linkages between the coastal and inland regions so that common development could be better promoted", the Ambassador said. Ambassador Wang Ke stressed that the opening of Chinese Embassy in Tanzania Dodoma Office is also a necessity in China's endeavor to deepen its cooperation with Tanzania for more tangible results, especially at a time when the two countries are implementing the outcomes of the Forum on China-African Cooperation (FOCAC) Beijing Summit and jointly implementing the Belt and Road Initiative (BRI). "We should establish more linkages between our development strategies and smooth the way for more efficient and effective communication", the envoy said. The Guest of Honor Hon. Prof. Palamagamba J.A.M. Kabudi (MP) , Minister of Foreign Affairs and East African Cooperation, said in his speech that the Chinese Embassy is among the first embassies that open a representative office in Dodoma, which is a testimony of the importance of diplomatic relations between Tanzania and China. He emphasized that Tanzania and China are all-weather friends, economically complementary, and the future of the two countries is inextricably linked. "Tanzania is a firm supporter of different Initiatives spearheaded by China including the FOCAC and the BRI," said the Minister. According to the Minister, Tanzania believes that the BRI will inject new and positive energy into the global development agenda, and Tanzania is determined to work towards finding the best means of unlocking the potential of ever-more closely interlinked production networks and value chains that are enshrined in the master plan of the BRI. He cited the ongoing expansion of the port of Dar es Salaam, rehabilitation and expansion of the Mtwara and Tanga ports, and the launch of direct flight by Air Tanzania from Dar es Salaam to Guangzhou, China as vivid examples of Tanzania's operationalization of the BRI. Hon. Azzan Mussa Zungu and Hon. Job Lusinde also delivered their speeches, in which both spoke highly of Tanzania-China traditional friendship and congratulated the Chinese Embassy in Tanzania for establishing an office in Dodoma. 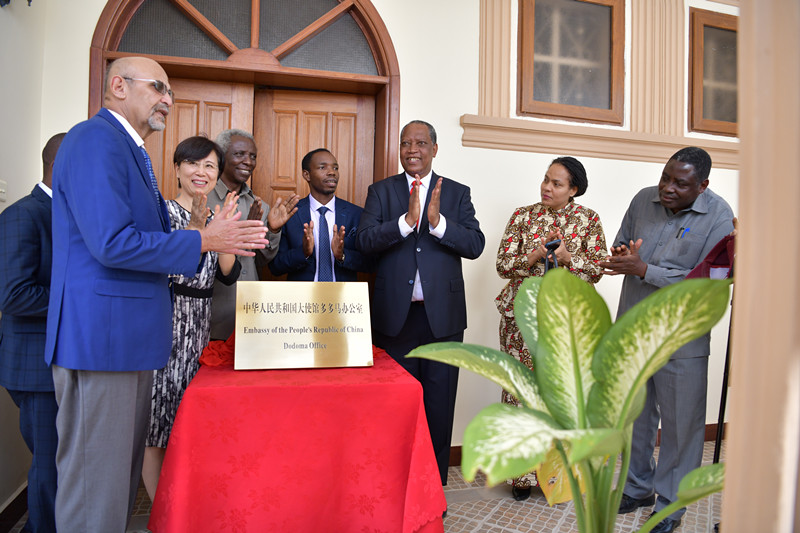 After making their speeches, Ambassador Wang Ke, Prof. Palamagamba Kabudi, together with other distinguished guests, unveiled the plaque of the Chinese Embassy in Tanzania Dodoma Office. Hosted by Mr. Liang Lin, political counselor of the Chinese Embassy in Tanzania, the inauguration ceremony was attended by over 60 people coming from various sectors of China and Tanzania.